When it comes to basement wall crack repair, there are many methods used today to try to try to stop water from leaking through the crack and into your home. Of the methods available today, BlueMaxx Basement Systems of Arnot, Brandon, Brochet, Dauphin, Island Lake, Little Grand Rapids, Lynn Lake, Melita, Nunalla, Port Nelson, Russell, & Swan River and the surrounding areas recommends Basement System's patented FlexiSpan® Basement Wall Crack Repair System. Call or contact us today for a free foundation wall crack repair estimate! That being said, if other repair methods never worked, they wouldn't be used at all. Most basement wall cracks work some of the time- for some amount of time. However, like most building practices, there is a bad way, a good way, and a best way to do it. Here are some of the repairs that we at BlueMaxx Basement Systems does not recommend. A commonly used method to repair wall cracks in Manitoba is to plug the crack with a caulk seal. This kind of fix is only skin deep- water will still fill the crack behind the patch. Efflorescence- a white, powdery mineral salt deposited by the water, breaks the caulk's seal, while the pressure of the water makes the caulk peel off. This kind of repair will last between 6 months and one year. Homeowners and waterproofers will sometimes try to fix a basement crack by chiseling an inverted V-groove in the wall and filling the groove with hydraulic cement. This rigid cement plugs the hole, but its bond with the cement is very poor. 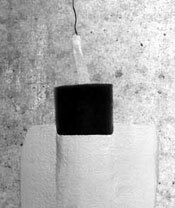 As the concrete wall changes with different temperatures and moisture levels, the plug will work its way loose. Efflorescence will gather around the seal, and soon water will be able to pass through. This fix usually lasts about two years before it fails and allows water into the basement or crawl space. Basement waterproofing contractors in Manitoba have been known to use epoxy or even grout to seal a foundation wall crack. These seals are strong and very rigid. However, epoxy must be applied to only a very dry surface, and because it's very slow to cure, it may run out the other side of the wall crack before hardening. Like hydraulic cements, epoxy plugs are rigid and inflexible. As the concrete wall expands and shrinks, this plug may fail. In some cases, it can even lead to a new crack forming near the existing crack due to the continued water pressure behind the wall. 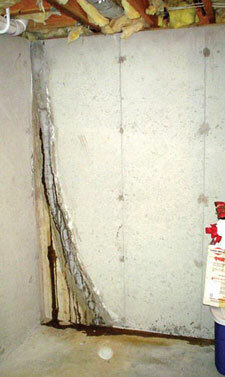 In some cases, new cracks may even form at weak points in the basement wall nearby, caused by the strain on the wall. One better method of sealing off a basement wall crack and areas nearby is to seal it with urethane. As the urethane sets, it effectively walls off the crack without running out the other side. Unlike the more rigid options, urethane can flex slightly with wall movement, helping it have longer life as the basement walls expand and shrink. However, a 1/16th inch crack can expand to as much as 1/8th inch. In these cases, urethane will not be able to expand nearly enough to maintain the seal. Eventually, even this solution will fail, and the gap will begin to leak once more. 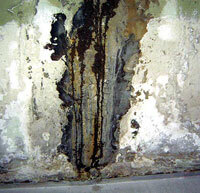 One of the best methods for sealing a leaking wall crack is to seal it with a high-viscosity polyurethane polymer. Unlike epoxy, some types of polyurethane can bond well to concrete even when it's wet. The high viscosity of some polyurethane polymers allows it to fill even hairline cracks, creating a deep hold on the edges of the wall crack. Unlike urethane, a polyurethane polymer is able to expand to up to 20 times its volume. This means that the seal will not be lost as the well continues its natural shifting, expanding, and shrinking process. Unlike the costly exterior methods, the work is non-invasive to the yard and can be completed in just a few hours. Even polyurethane polymer sealing, however, can experience a partial failure, and over time, these seals will also occasionally show a small leak. Click for more information about BlueMaxx Basement Systems' FlexiSpan® Wall Crack Repair System, or call us today for a free leaky basement wall crack estimate! We service Manitoba, including Winnipeg, Arnot, Brandon, Brochet, Dauphin, Island Lake, Little Grand Rapids, Lynn Lake, Melita, Nunalla, Port Nelson, Russell, & Swan River.